So remember how I told you to drop back by the blog today for a 📣big announcement? Well, the wait is over! 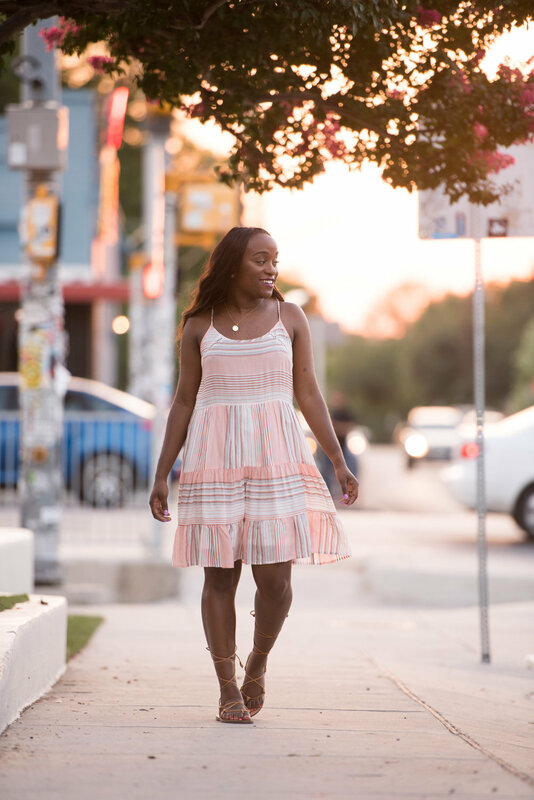 I had the pleasure of shooting a lookbook with Austin boutique, Maya* (pronounced: Maya Star), featuring the sweetest summer dresses to wear this season. I'm sharing my favorite styles with you in celebration of the iconic South Congress boutique for fashionable locals and bohemian chic girls everywhere launching their new online store! 💻 Scroll to shop! This cut-out shoulder floral beauty is ideal for a bridal or baby shower, summer wedding, or a sweet date night when the temperature is high. The wrap style top and ruffled hem and shoulders add a sweet feminine touch to this dress to make you feel v pretty wherever you go. A forgiving waist and flare skirt make this frock a perfect fit for any body type! I opted for some simple brown wedges to help showcase my legs and accentuate my petite curves. If you've ever been in Austin for a weekend or you've lived here for at least 24 hours, you know we take our brunch v seriously. Austin has long-since been a foodie destination, but with the brunch trend going global, we've stepped it up to a new level with the best breakfast-meets-lunch offerings you can find pretty much anywhere. The boho pattern and bright array of oranges is beautiful on any skin tone. In addition to being unlined and a super soft viscose material, this dress ties in the back for maximum breathability and comfort. I added some fun accessories like the Perfect Party Earring and a chic leather, and espadrille bucket bag to keep things bright and brunch-friendly. Maya Star boutique owner Maya Krauss has made it her mission to travel to the world's most fashionable destinations 🌎 and source the shop's inventory with fun, Austin style essentials made by independent brands. So naturally, it makes sense that since the boutique is located deep in the heart of Tejás , there would be some Mexican influence in several of the store's items. This Fiesta Off the Shoulder Dress delivers the perfect combination of versatility, folklore, and festive fashion. I grabbed the Fruit Basket Embroidered Clutch and a pair of Emma Sunglasses to showcase all the color possible. I don't always wear pink, but when I do, it's by way of a über cute, relaxed sundress that's perfect for a summer vacay.💕 This loose-fitting frock is full of details like pink stripes, subtle cutouts and adjustable straps for a cozy fit that's still fashionable. I chose to style this dress in a super simple way, with a dainty Bea Star Necklace. But don't let me stop you! Add some stacked bangles and your favorite pair of espadrille wedges to complete an effortless look. Now y'all know I couldn't shoot a lookbook without adding something short, tight and sessy to the mix. 😉 This muticolored bodycon dress is known as the "magic dress" because it literally makes any body shape look like a whole snack. 🍔 This dress is perfect for turning heads out on the town. I recommend wearing some strappy heels and adding a cute statement bag, like this Red Wristlet Crossbody Bag to vamp up the saucy vibes. I'm looking ahead at the next installment of my Maya* summer lookbook. Stop back by le blog this weekend for a look at all the cutest rompers you need in your closet for the season scorchers to come! Until then, shop the new Maya* online store and snag free shipping when you spend $100 or more!